Synthetic marijuana, or “bath salts,” is typically marketed under playful names like “Spice,” “K2,” “Blaze,” and “Red Dawn X.” However, there is nothing fun about being arrested for distribution of synthetic marijuana. In fact, this designer drug is more severely punished than actual marijuana. If you are accused of distributing synthetic marijuana in New Jersey, you will likely face felony-level charges and significant penalties that include a lengthy prison sentence. That’s why your first step should be to speak with an experience criminal defense lawyer about your case. The Tormey Law Firm is a drug defense team that includes a former county prosecutor and a lawyer worked at the United States Attorney’s Office. We know what it takes to win drug cases in New Jersey because we’ve got experience on both sides. Our lawyers defend clients facing drug charges throughout Essex County, including Irvington, Nutley, and Orange. When you hire us, you can rest assured that our top priority will be to win your case and keep your permanent record clear of a drug crime conviction. Contact the Tormey Law Firm by calling 201-654-3464. One of our experienced lawyers will be happy to speak with you and answer any questions you might have about your synthetic marijuana charges. 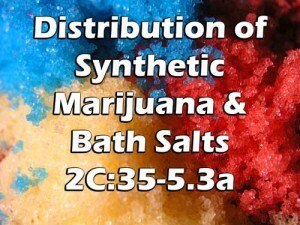 Distribution of bath salts is criminalized in the New Jersey Criminal Code under N.J.S.A. 2C:35-5.3a. As set forth by the statute, it is a criminal offense for any person to knowingly or purposely manufacture, distribute, or dispense bath salts. The statute also criminalizes possession with intent to manufacture, distribute or dispense. This means that, under certain circumstances, a possession of bath salts charge can be elevated to a distribution of bath salts charge. The weight of the drugs can also be affected by the presence of adulterants, dilutants, or cutting agents. The statute also prohibits the distribution, or possession with intent to distribute, of these substances. The knowledge attorneys at the Tormey Law Firm are available 24-7 discuss your synthetic marijuana distribution charges. Call us today at 201-654-3464, or fill out the online contact form to schedule a free consultation at our office in Newark, NJ.